The circulatory system is an organ system that is responsible for the facilitation of blood flow throughout the body. This flow of blood transports oxygen and nutrients, such as amino acids and electrolytes, to the various parts of the body and its billions of cells, and carries away cell-produced wastes, such as carbon dioxide. The circulatory system also plays a key role in maintaining homeostasis, such as by regulating body temperature and the pH of the blood. The three main components of this system are the heart, blood, and blood vessels, such as arteries, capillaries, and veins. 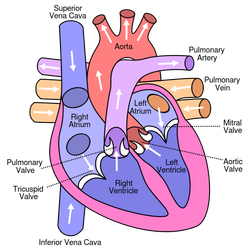 The heart is a “hollow muscle” that comprises of arteries, veins, capillaries, valves, and four main chambers. This muscle works hard to “pump” oxygen-rich blood to the various other parts of the body and to receive and replenish oxygen-depleted blood. The blood consists of red blood cells, which carry oxygen and carbon dioxide, white blood cells, which attack and destroy disease-causing materials, platelets, which facilitate clot formation to stop bleeding, and plasma, which is the liquid component of blood. The blood vessels make up the vast network of blood-flow pathways throughout the body. Malnutrition is the absence of proper and adequate nutrition. This absence of proper and adequate nutrition encompasses both overeating or eating unhealthy food (which can lead to obesity) and under eating (which can lead to anorexia). Malnutrition alone can heavily lower the body’s ability to fight off diseases and repair itself, such as by lowering the individual's white blood cell count and their production of new red blood cells over time. One of the subsequent results of malnutrition can be Type 2 Diabetes, which is a form of diabetes in which the body begins to stop producing insulin or becomes resistant to it. Insulin is a hormone secreted by the pancreas that helps the body break down sugars and utilize its energy. Without proper production of or response to insulin, the body is unable to break down all of the sugars an individual consumes, which leads to higher than normal amounts of sugar in the blood system. Since the circulatory system is interconnected with the other organ systems in the body, these higher than normal amounts of sugar in the blood can have detrimental effects throughout the body, such as tiredness, dizziness, fatigue, blurry vision, frequent urination, and loss of blood circulation to certain parts of the body. The image to the left depicts the effects of Type 2 Diabetes on the flow of blood throughout the body. Due to the various health related issues that can be caused by malnutrition and subsequent Type 2 Diabetes, it is important for individuals to consider either maintaining an already healthy diet and exercise regimen or slowly improving their bad eating and physical activity habits.